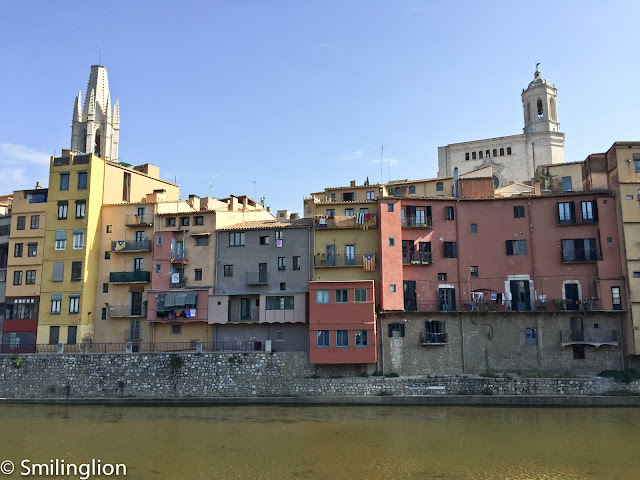 Our trip to Valencia was decided only at the very last minute, as we started our trip at the Alicante coast (ostensibly for the beaches and Quique Dacosta) and had to find our way back to Barcelona. We didn't fancy the long drive back, hence the logical stopover in Valencia, Spain's third largest city. Frankly, the only thing we knew about Valencia was that it was famous for its paella, and not much else. We had never heard of anyone going to Valencia for fine dining. Moreover, we heard that paella in Valencia was a lunch dish so we were lost for options for dinner during our two nights in the city. Inevitably, we turned to the trusted Michelin Guide and found a small number of Valencian restaurants listed therein (all only with one stars). Of those, Ricard Camarena (the restaurant) had just obtained its star. After doing a bit of research online, we found out that Ricard Camarena (the chef) previously had a Michelin starred restaurant (Arrop) at the exact location where the new hotel we were staying at (Caro Hotel) now sits. On the back of that bit of coincidence (and a few positive reviews online), we made a Tuesday night dinner reservation. It was raining that night and when the taxi dropped us along the rather deserted street, it took us a while to find the restaurant. 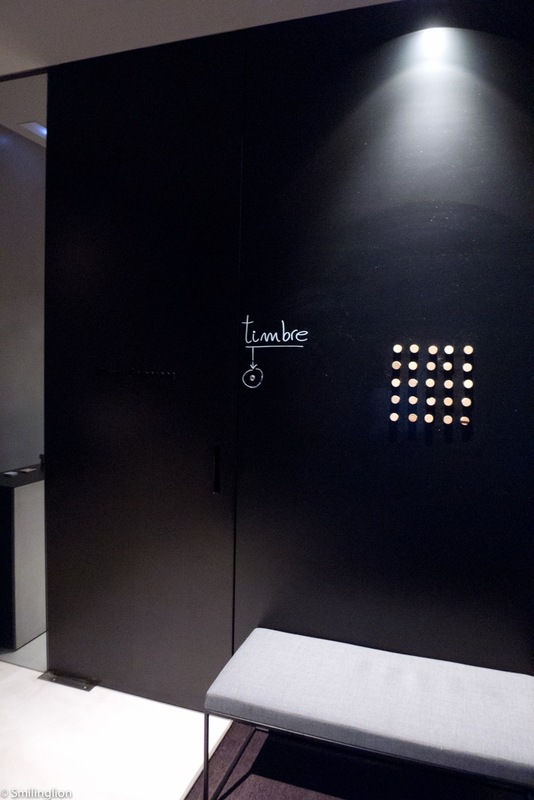 Instead of the usual shopfront, there was a stark black wall with a doorbell which screamed to be rung. We thought it was too cool for school. The door opened and we were welcomed into a beautifully ordained restaurant. The dining room overlooked the open-concept kitchen and the room felt quite conducive for the kitchen to interact with the diners, yet the tables were sufficiently far apart as to still retain some privacy. We were the first people there and had the pick of the tables (they weren't fully booked that night). The servers there were very young and energetic, and served us throughout the night with some wit and panache. We opted for the tasting menu and the sommelier recommended glasses of wine for us throughout the night. The white and red wines native to the region which we had that night were quite fantastic. Canapé with sea snake, ham and peanuts: When the first dish was served, we knew it was going to be a special night. 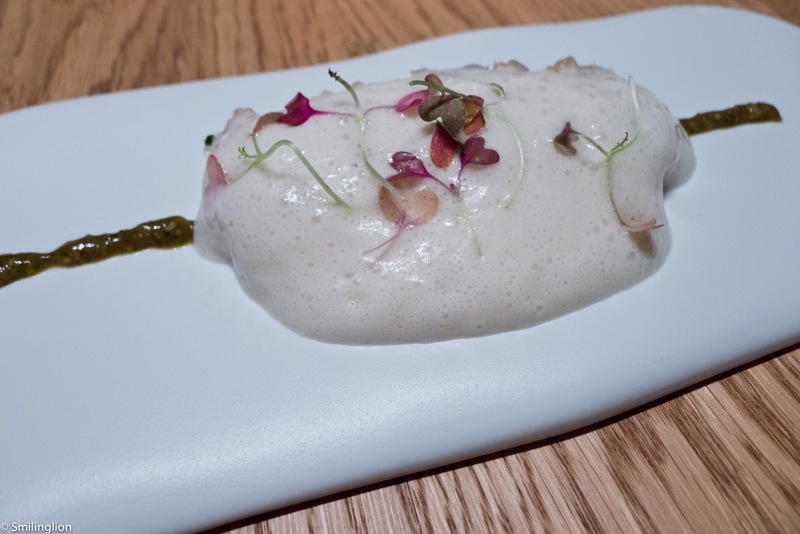 This was a piece of toast covered by a foam made with smoked eel (which is what we thought the sea snake was), peanuts, olive oil and spanish ham). It was a wonderful marriage of flavours which were new to us. 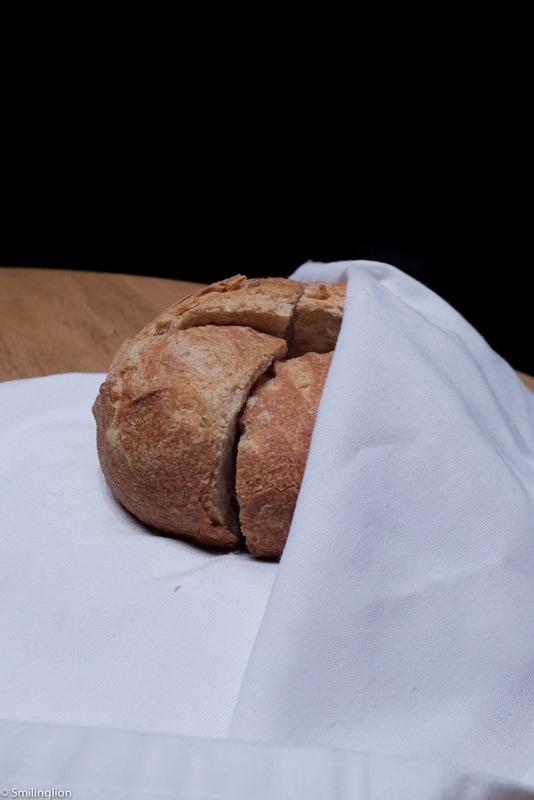 The bread they served was organic and baked in-house. Octopus with coriander, lemon and cucumber: A dish which reminded strongly of Vietnamese pho, the octopus was sliced into thin strips and had the shape and consistency of rice noodles (but of course more chewy). The lemon and coriander gave the distinctive Vietnamese flavour and the ricotta cheese give it some of the savouriness. We wondered if indeed the chef intended for this dish to taste like that, but it was very delicious nonetheless. Anchovy with leek, salt and butter: This was another spellbinding dish. 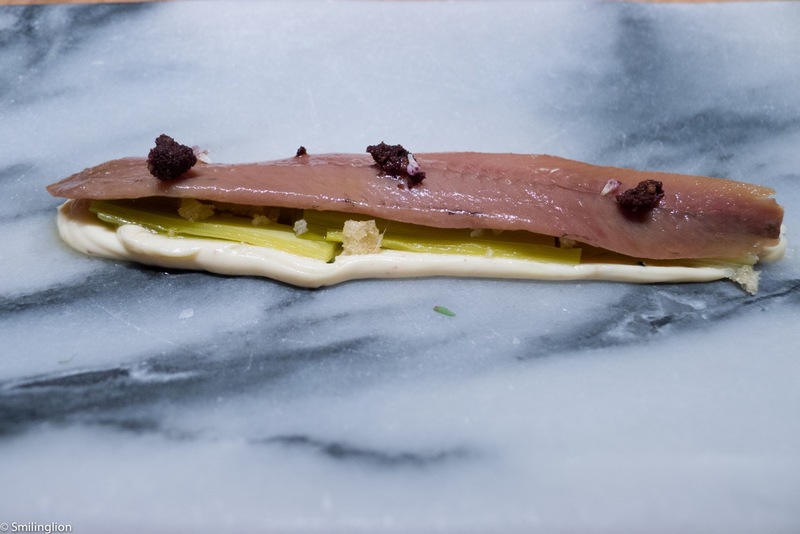 It was an inspired choice to combine the strong, 'fishy' flavour of the anchovy with the balancing qualities of the leek and finished with the decadent burnt butter. Tuna tartare with broccoli and cold roasted tomato soup: The piece of broccoli was cored and spread over a dollop of tuna tartare. This was another delicious creation by chef Ricard, with all ingredients working well together. White asparagus with raw shrimp and shrimp tartare: The excellent meal went on. 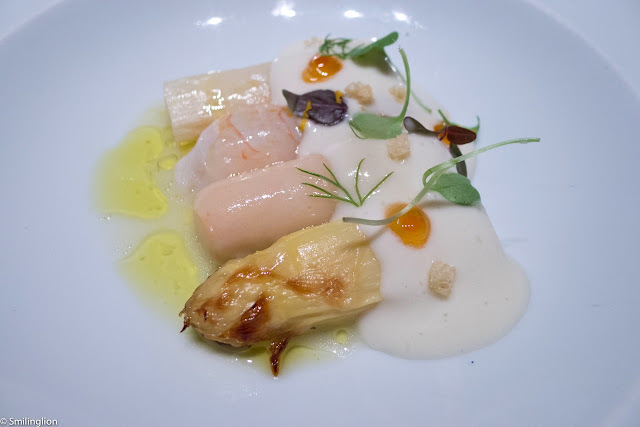 This was a double pairing of shrimp and white asparagus, except that one shrimp was raw and the other was a tartare. It turned out to be a perfect combination (in both cases). The white cream sauce was slightly too heavy though and the dish didn't really need it. Rice with blue fish: The rice was very sour but this was neutralised to a large extent by the onions and the mayonnaise. It was good, but we didn't understand where the blue fish was as there didn't seem to be any fish in this dish. 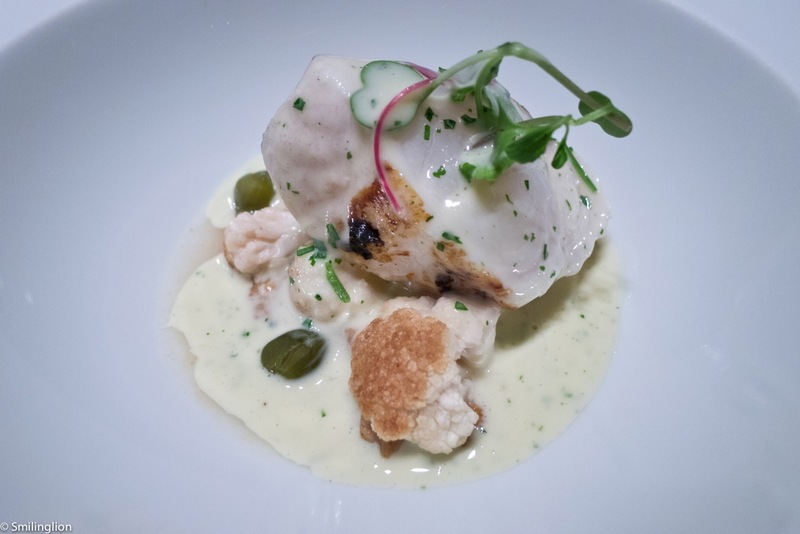 Monkfish with capers, roasted cauliflower and olive oil: Ricard Camarena's monkfish was perfect. This was reminiscent of the best monkfish we had in the three Michelin starred Parisian restaurants. It was cooked with precision, leaving it with sufficient bite yet wasn't too chewy. The roasted cauliflower was an interesting yet appropriate accompaniment to this dish. 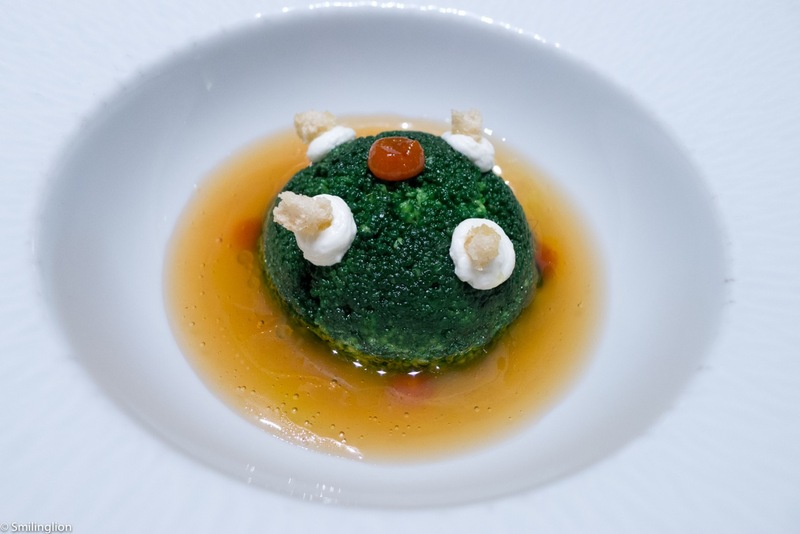 Chef Ricard must have been very proud of this dish as he served it to us himself. 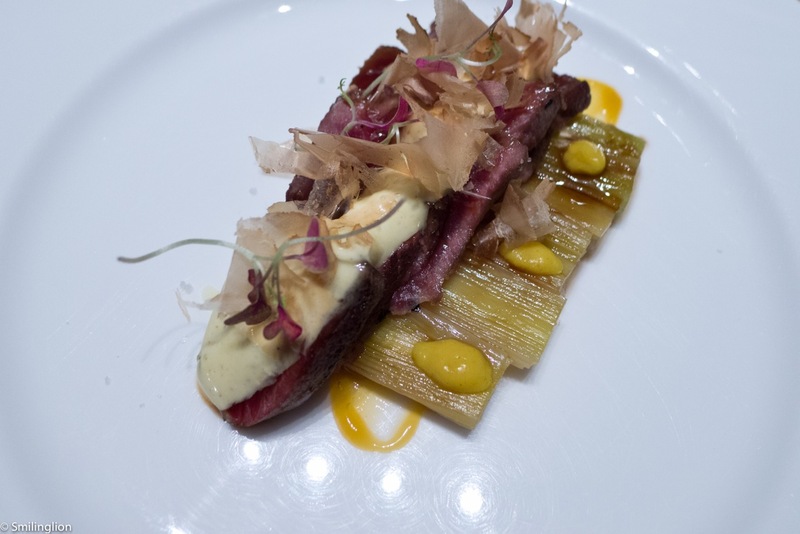 Acorn-fed Iberian pork shoulder with grilled leeks, mustard and dry tuna: It was a piece of pork which tasted so much like wagyu beef that we had to ask the waiter twice just to make sure. Once again, the use of leeks worked, and the dry tuna flakes was a substitute for sea salt over the meat. 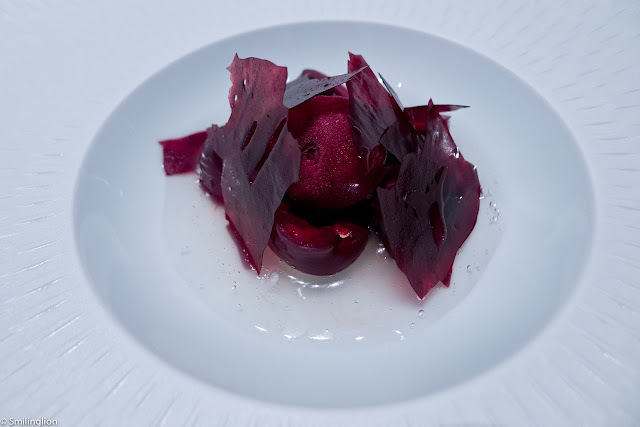 Alicante's mountain cherries, yoghurt and eucalyptus: The level of sophistication of Chef Ricard's cooking continued with a truly unique pre-dessert. The cherries yoghurt sorbet was rich in flavour and was balanced in both its sweetness and sourness, but it was the use of the colourless eucalyptus 'juice' which took this to the next level (although the unique flavour of the eucalyptus made this dish give off an aftertaste of raspberry cough syrup). Coffee, burnt milk, butter and macadamia: The best was saved for last. 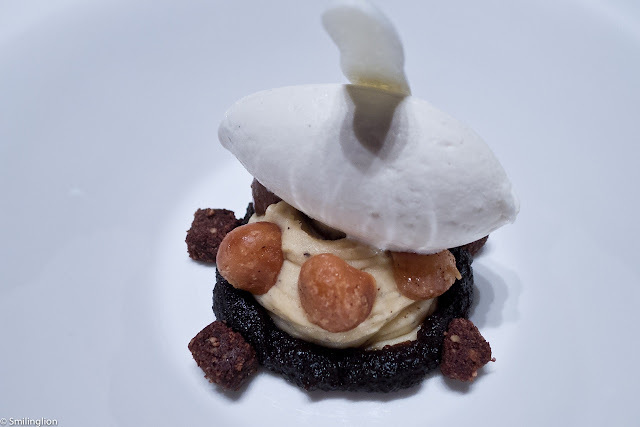 This was a fantastic concoction of some of our favourite dessert things, and was perfectly balanced in its execution. Interestingly, we were not served any mignardises after dinner, but with the meal we had just had, this was something we could overlook. 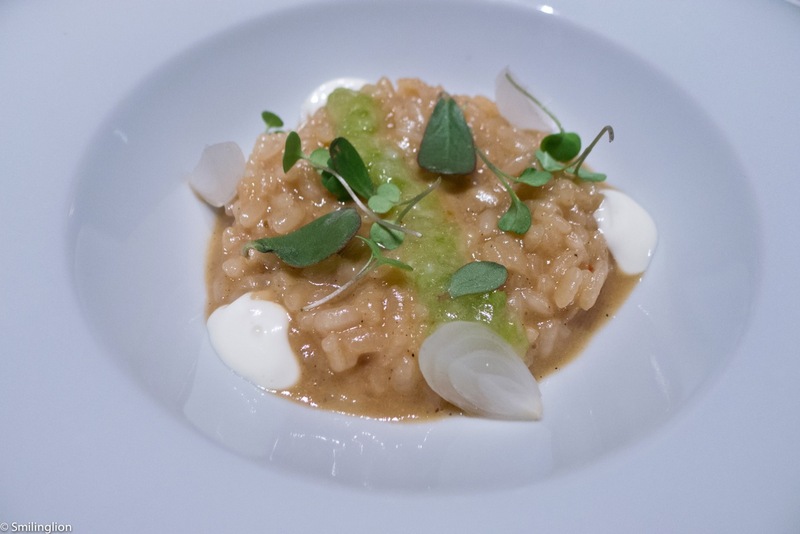 Final Thoughts: Our dinner at Ricard Camarena took us by surprise. 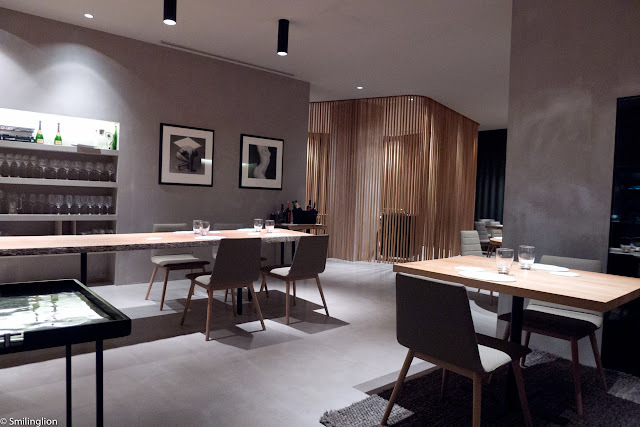 We did not expect to find such a gem of a restaurant in Valencia. 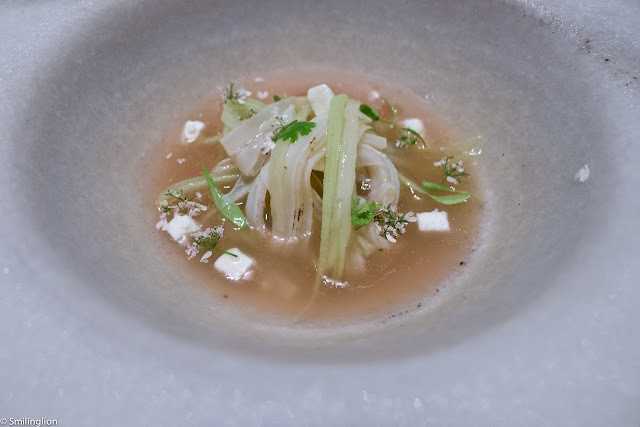 This wasn't a particularly complicated meal, but the light-touch cooking of chef Ricard and his use of ingredients and flavours was so successful and the service so warm and genuine that we had a really enjoyable evening.